In partnership with soccer magazine, FourFourTwo, and soccer club, Swindon Town FC, Samsung is launching a nationwide search for one amateur player who will join the professional squad under a one year professional contract. 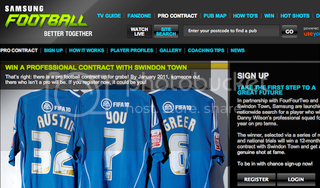 The Pro Contract Promotion is part of a new partnership between the electronics giant and the English football club. Entrants can upload their profiles to the Samsung microsite and scope out their competition ahead of try-outs. "This is not a reality show. The opportunity is genuine. Prove your worth and you could change your life and become a professional footballer." The winner, selected via a series of regional and national trials, will be given a full 12 months to prove his worth and earn a contract extension.